Florence “Flo” Farnham Thomas, age 91, of Auburn passed away peacefully on Thursday, April 11th at Oak Park Nursing Home. She was a native of Evergreen, Al but spent her early years in Auburn. She graduated from Lee County HS (Auburn High) and was a secretary in the Auburn University Athletic Department for four years before her marriage to Joseph G. Thomas of Grenada, MS in 1949. She was a devoted homemaker and proudly served as Cub Scout Den Leader to her two sons. She was heavily involved in church activities as well, including her participation in various church choirs in Alabama, Tennessee and Texas. 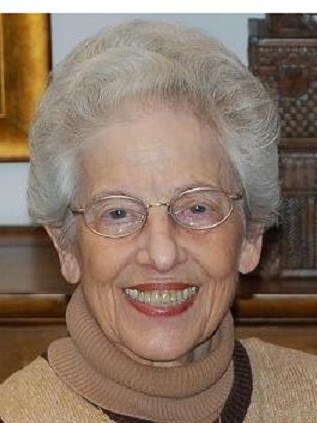 Flo was an avid fan and supporter of Auburn University throughout her life. She also loved to write poetry and share it with others whenever the opportunity arose. She was preceded in death by her husband, Joseph G. Thomas, and her granddaughter, Kari D’Anna Thomas. She is survived by one sister, Hermione Hutchison of Birmingham, sons George Thomas (wife Jane) of Waynesville, NC and Roger Thomas (wife Jada) of Birmingham, and grandson Christopher (wife Katherine). A memorial service will be held at Holy Trinity Episcopal Church of Auburn on Saturday April 27th at 10:00am. In lieu of flowers, the family requests that memorials be made to Holy Trinity Episcopal Church.